Just some pictures today. I am down to the wire on getting my Masters Thesis together & submitting it TOMORROW. So unfortunately, all of my brain power has officially been committed elsewhere. Be back soon! 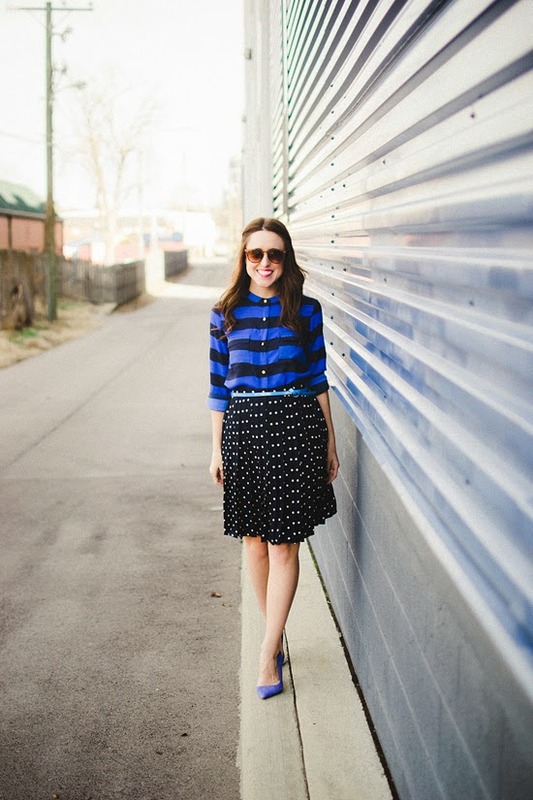 Don't forget to enter to win a $75 Nordstrom Gift Card from Delany over at Lover of Clothes! Good luck getting the thesis submitted! I pulled my one and only all-nighter the day mine was due (it was a noon deadline and I made it at 6am)! 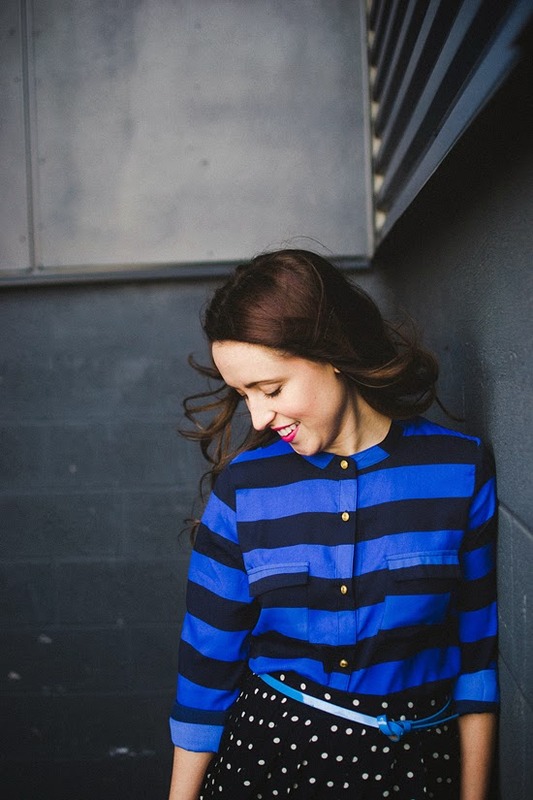 Jess, these pictures are SO fabulous of you–I love the fun setting, and the blue top and shoes totally pop. Good luck with your thesis! You look so pretty! Great skirt. Wishing you the best on finishing your thesis...XO! 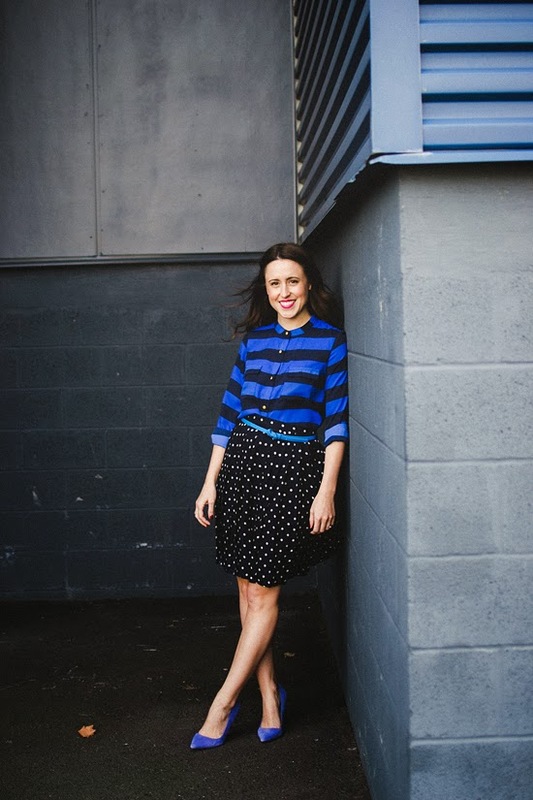 Such a cute outfit, and what a find with that thrifted skirt! Love the shoes, need to be on the lookout for those! Good luck with the thesis! This pattern mixing works so well- the color palette is what really pulls it together for me! I LOVE this outfit. It looks like it could translate so easily from work to play. Ummmm I'm obsessedddddddddd with this outfit and pinning now:) And good luck with all that yucky school stuff haha! You are blue and beautiful!! dang girl, staring 2014 with a bang....might be some of my favorite photos since we have been buds!! You got this thesis in the bag!!! Hang on, you are almost there!! Oh my gosh I am totally going to have that song stuck in my head! Good luck on the thesis! 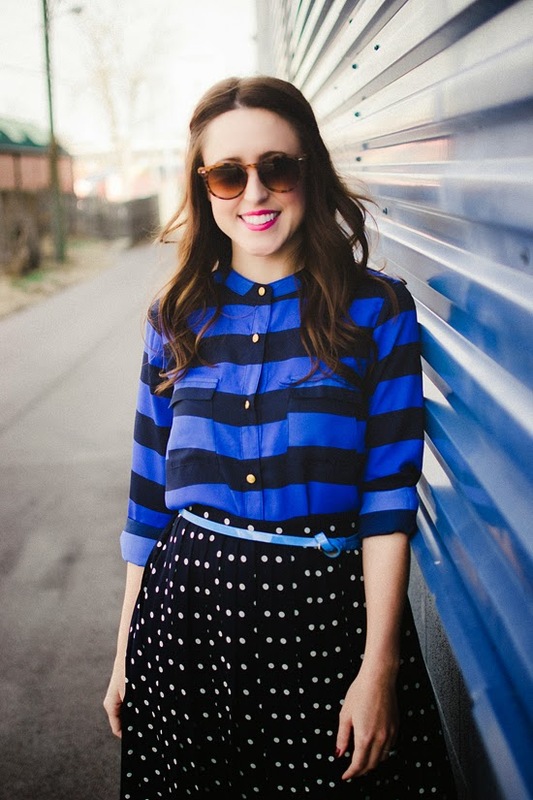 I love that blouse and the combination of the bright blue and your fushia lipstick! Love love this combo! 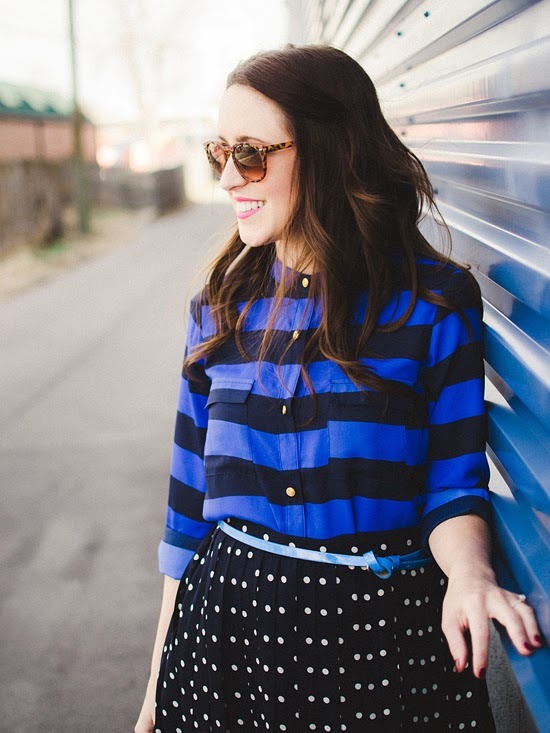 Stripes and polka dots belong together. I am madly in love with that skirt. Good luck with your thesis! LOVE LOVE LOVE this look! The print mixing is perfection and these photos are gorg!! These photos are GORGEOUS. You look absolutely breath taking! Blue is a good color for you! Good luck with the thesis! You will rock it. 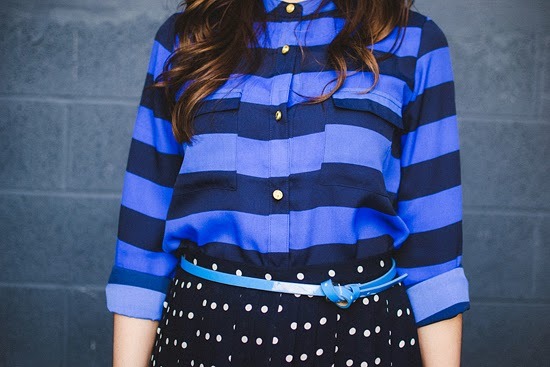 Great mixing of blue hues today! I could not love you more for quoting that Eiffel 65 song hahaha. Good luck on your thesis! I can't believe you still look this good mere days before. If I had done a thesis, I guarantee I wouldn't have been dressed in real clothes the entire month before. Such an elegant outfit! You look lovely lady and the blue really suits you! 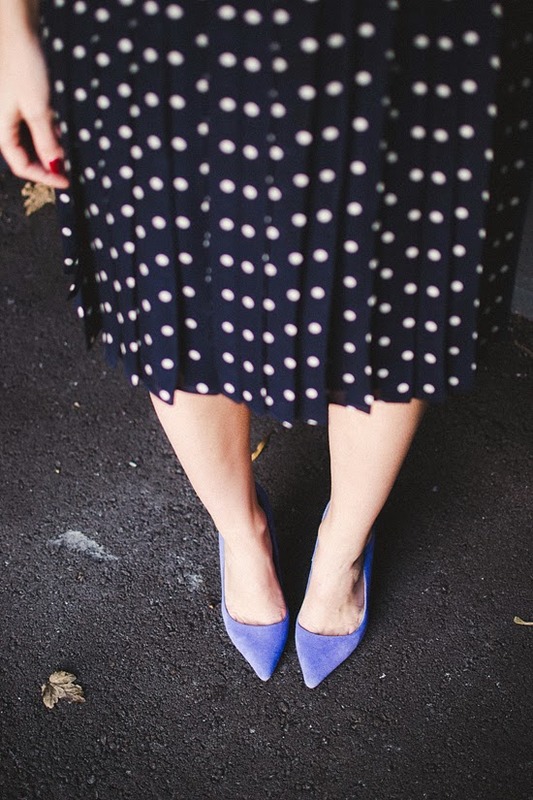 those blue high heels are so cute! That skirt is amazing. You look gorgeous in blue! Also, best of luck with your thesis. I know how stressful turning in major assignments can be. Don't forget to celebrate afterward! This skirt is a thrifted dream! Gorgeous pictures too. Wishing you the best as you're submitting your thesis, go girl!! Thank you! It took an all-nighter, but that bad boy is all turned in. And dang I didn't recover from said all-nighter quite like I did back in college! Thank you! I figured the only thing this blue outfit needed was more blue! This all blue apartment building was the perfect fit! Ooh I'm putting that on my resumé… "expert twirler"! This might be the best thrifted piece in my lifetime. Do you have a "Mentor's Closet" near you - if so, I say check. it. out! Thanks for the pinning lady! Yucky school stuff is OVER! Now time to recover & then find a J-O-B! Thank you pretty kitty - I just get dressed, Zipporah makes the magic happen! Aw, Thank you lady! I think that I'm going through my Blue Period! Oh man, 106 pages of my blood, sweat & tears in the bag! Phew!! Thanks for the support lady! Haha, you're welcome for the blast from the past lady. And this is when I was in denial about how much I actually had left to do - the look quickly changed to that of a red bull fueled manic, decked out in sweat pant material. I call it my sweat suit! Yay! Congratulations - a done thesis is a good thesis!